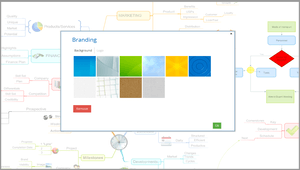 iMindMap’s Presentation View is your go-to resource for building captivating presentations in no time at all. A far cry from the standard form of presentations, with Presentation View you can create vibrant presentations that will dazzle your audience and make sure you get your point across. Get your presentation off to a flying start with iMindMap’s ready-made Templates. Cut down your preparation time by choosing the type of presentation you want to deliver from the templates options, including styles for teaching, meetings and seminars, and let us build it for you. These options can be found by clicking the ‘Templates’ tab. 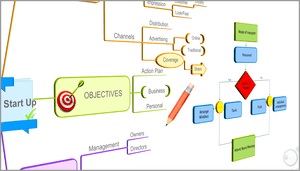 Jazz up your presentations with iMindMap’s variety of background options. Simply click the ‘Branding’ tab and choose the ‘Background’ option to take your presentations from basic to masterpieces in just a few clicks. Give your presentation a professional touch by adding your organisation’s logo to your slides. This feature can be found by clicking the ‘Branding’ tab and choosing the ‘Logo’ option. Choose where you want the logo to appear on your slides to automatically apply it to your whole presentation. iMindMap’s Kiosk Mode is like having an extra pair of hands. 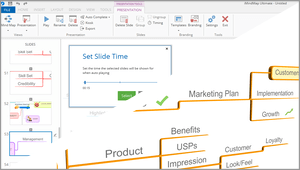 Choose how long you want each slide to appear for using the ‘Timing’ options in the top toolbar, click ‘Kiosk’, and then stand back as iMindMap navigates through your presentation for you. You can get on with presenting to, and engaging with your audience without having to worry about when to change slides. There’s no easier way to bring your presentations to life than with iMindMap’s 3D View. Visually stimulating 3D images and background environments will certainly make your audience sit up and pay attention. When switching to Presentation View from Mind Map View, select the 3D option. When in Presentation View, turn your presentation 3D in the ‘Settings’ tab. 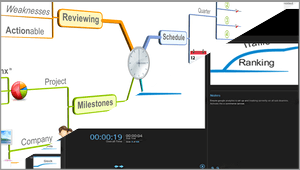 Presenting is a walk in the park with iMindMap’s Presenter Screen feature in Presentation View. Flaunt your presentation on one screen and use the second screen to display additional information to aid you while speaking. iMindMap’s Slide Notes can be attached to specific points in your presentation and appear on your second screen to prompt you when needed. Simply select a branch and click the pencil icon to add slide notes to your presentation slides. With iMindMap, you can export your presentation slides to PDF, PowerPoint slides, video or YouTube by clicking the ‘Export’ option in the top toolbar. Why not share your presentation with your audience afterwards to leave a lasting impression? It’s also great for creating handouts. 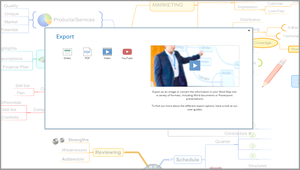 The Presentation View in iMindMap has everything you need to build an engaging, unforgettable presentation easily. Its powerful features will do the hard work so that you can focus on one thing – presenting. This means your presentations will offer a more stimulating, worthwhile experience for you and your audience. 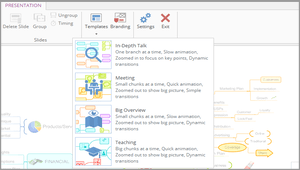 Download the iMindMap 9 Ultimate 7 day free trial and start building your presentations with the powerful Presentation View. You will be amazed at just how simple it is to create effective presentations that are guaranteed to wow your audience.